grandma's cookie jar: The Most Powerful Post I've Ever Been Blessed to Read! The Most Powerful Post I've Ever Been Blessed to Read! If the truth be told, when you are asked what you do to pass your faith on to your grandchildren, do you say something along the lines of, "I pray for them. ", but sound like you are not really sure it is doing all that much to "just" pray? Do you struggle with praying? 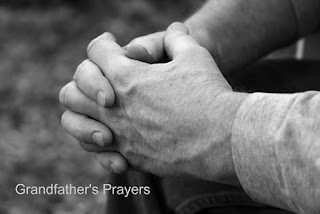 Do you truly see prayer as one of the, if not the, most powerful and important things you can do for your grandchildren? If praying is something you may do, "half-heartedly" or even rarely or not at all, or even if you are a committed prayer warrior on behalf of your children and grandchildren, please take a moment to read the post Sherry Schumann wrote for the Legacy Coalition facebook page today. It is one of the - if the the - most powerful posts I've ever been blessed to read. Go ahead, follow this link and read it right now . . . it starts with "He wasn't my grandfather, not really . . . " and has a black and white photo of praying hands. Did you read it? (If not, please do) If so, do you agree with me . . . this is one of the, if not the most powerful post you've ever been blessed to ready? Do you see prayer differently? Are you encouraged to become a true person of prayer? Prayer really does change things. Prayer really does change us!